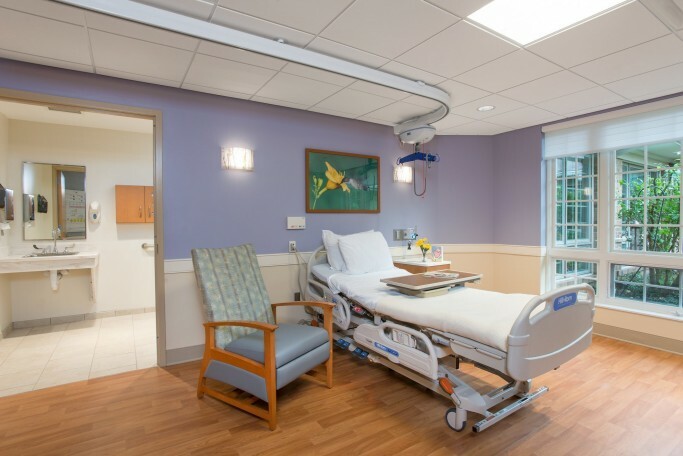 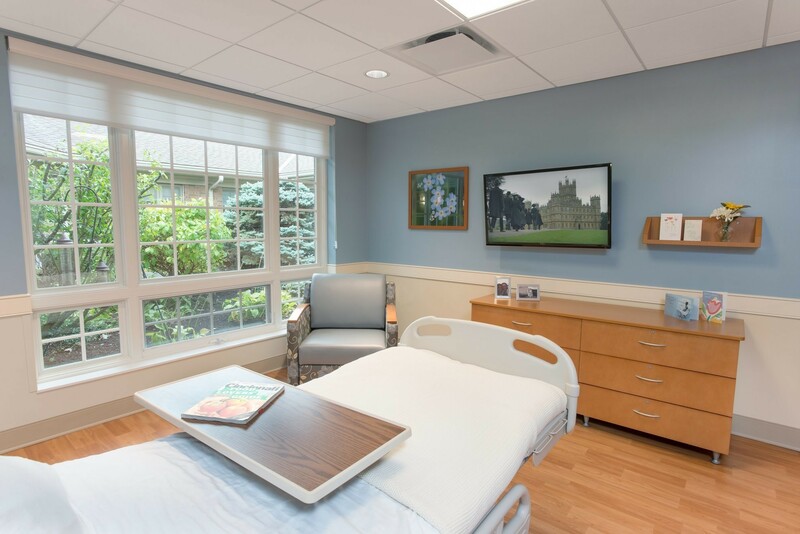 'Calming and compassionate' characterize renovation of Hospice of Cincinnati's Margret J. Thomas Inpatient Care Center. Hospice of Cincinnati’s desire for a soothing, up-to-date atmosphere motivated renovation of their Blue Ash Inpatient Unit. 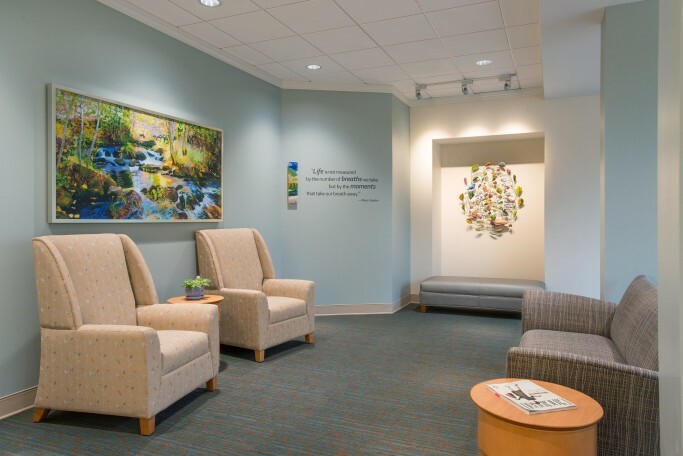 While the basic patient room layout was satisfactory, the staff team station and family lounges were reworked to become more inviting and better serve patients and their families. 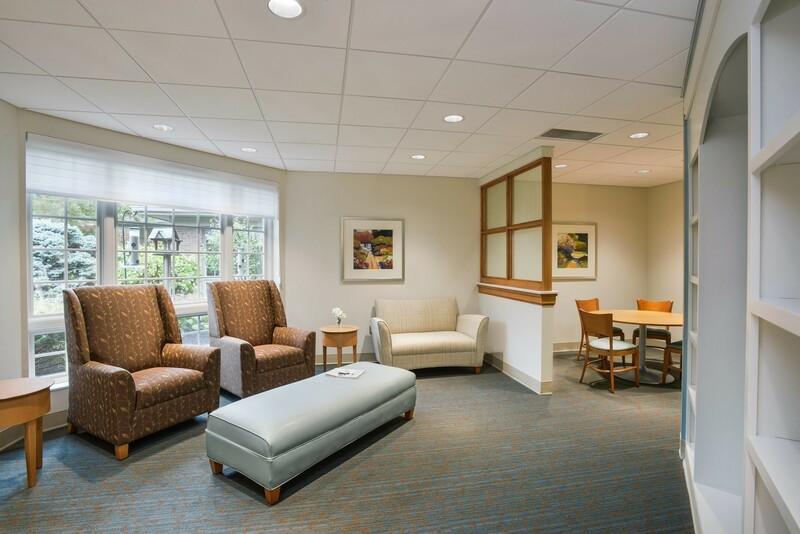 All new finishes and furniture, including flooring, ceilings, lighting, and mechanical and electrical upgrades, harmoniously improve the entire unit to a level of attractive, understated comfort appropriate to supporting the Hospice’s mission. Champlin’s renovation strengthens the garden theme, reflecting the journey of life, originally envisioned for the facility — involving 40 private rooms and 38,000 sf. 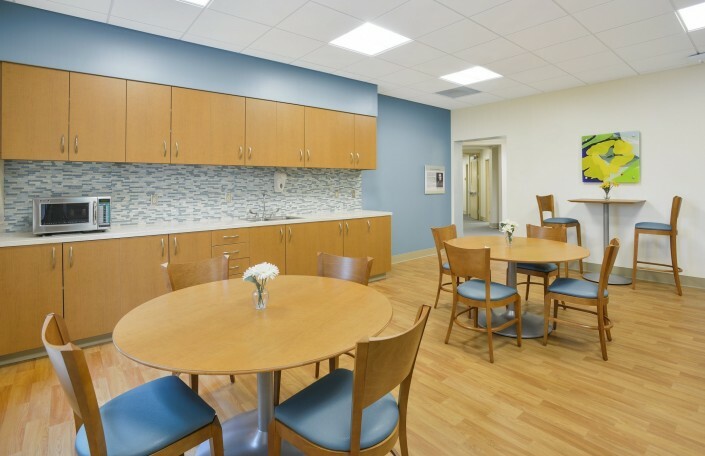 Familiar elements of traditional furniture and residential spaces propagate the peaceful ambience designed to accommodate and comfort terminally ill patients and their families. 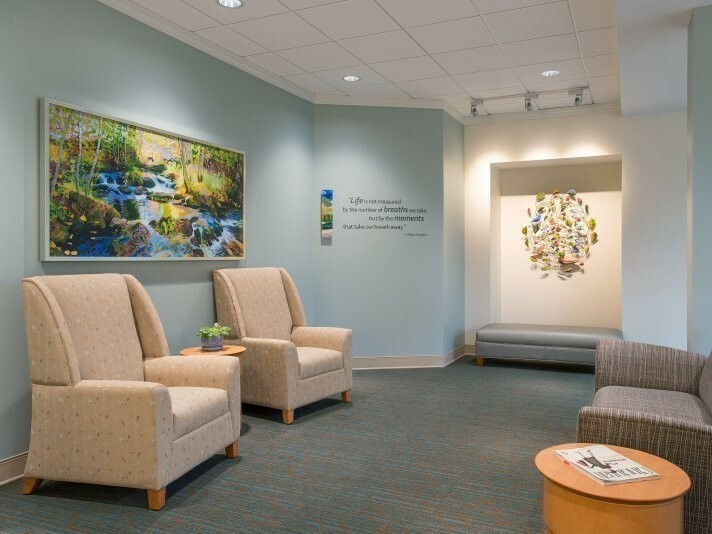 Colors are soft, yet distinct. Rift-cut light cherry wood warms the environment — used for flooring, furniture, millwork, accent ceiling planes, and screenwall framing. Most remarkable is that this relatively large facility feels so appropriately scaled, yet incorporates considerations of durability and serviceability necessary for practical operation. 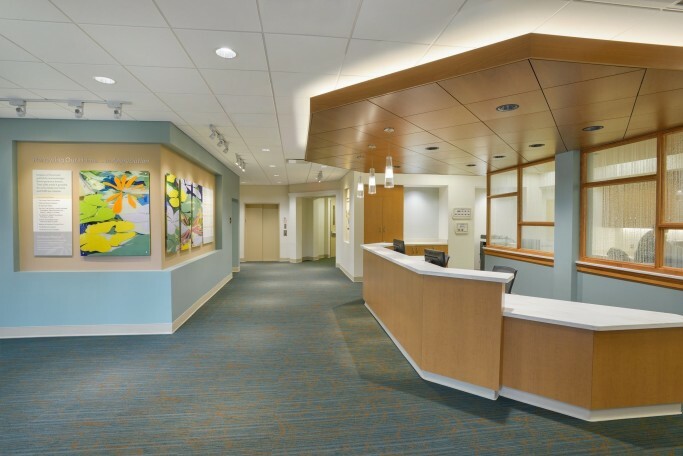 Champlin’s interior designers introduced art as a way of imparting meaning. 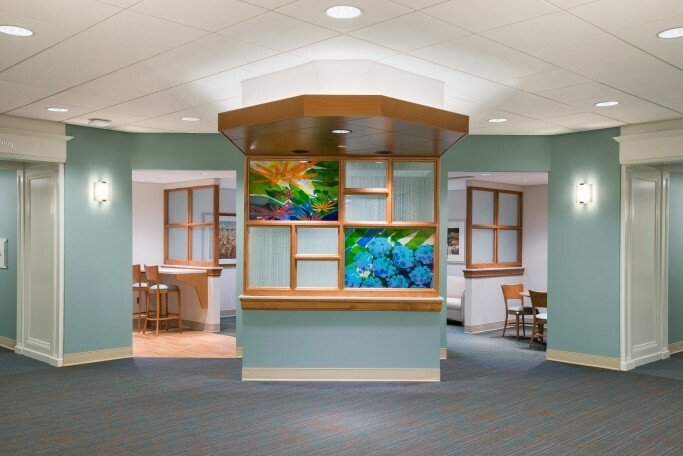 Working with a noted glass artist and the garden theme, we developed an art strategy which resulted in commissioned pieces for specific locations, including decorative art glass screens, art glass wall sculpture, and art glass wall panels accompanying expressive text. Further, other commissioned art in the form of paintings and photography within each patient room and family area and room signage custom-designed by Champlin’s graphics experts holistically personalize the environment.